If you’re short on last-minute gadget presents for Father’s Day, forget the idea of getting him a nice pair of speakers and make up for your tardiness by getting Dad not just one gadget but a giant wall of them. We’re talking about the Man Wall from Hybrid Space Furniture. This room-dominating gadget matrix is, err, marketed at men, and in the view of its makers it incorporates all that a man could ever want from a wall. That is: three or more flat panel LCD HDTV screens, DVD player with 5-CD changer, Panasonic 5.1 home theatre system, a full-size built-in beer keg with refrigerator and tap, a live 7-ft sports ticker, a microwave oven, two cigar humidors, a five-speaker home theatre surround sound system, two wireless surround speakers, an iPod docking station and a 32-bottle wine rack. 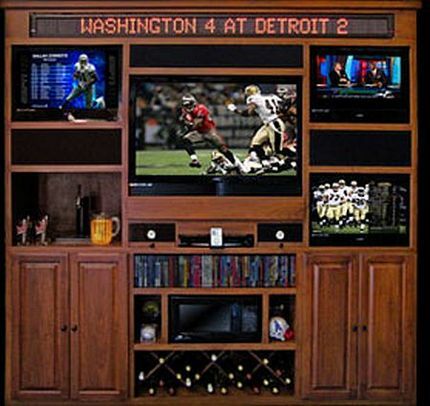 Having over three different screens means your Dad can watch multiple sports games at the same time – all commanded from the same remote control – while seven-foot long game scores flicker above his head, on the sports ticker controlled by a built-in computer. He could pour himself a beer, while choosing a wine, listening to his iPod on top-notch surround sound, microwaving dinner and having a couple of cigars on go. Designers claim the Man Wall is practical because of its space-saving technology. “Measuring a mere two feet deep, eight feet wide and just under eight feet tall, the Jetson-like system takes up about a third of the space as each component would separately” claims the press release. But – before launching ahead and blowing $14,900 (plus shipping) on this impressive multi-gadget wonder wall, you might want to check with whoever has to share a house with your Dad that it goes with their interior décor scheme and lifestyle choices.